I love coffee. I love tea. I love them as sweet as me. But I need to quit drinking caffeine. I am on day two of no coffee and it is as grueling as a marathon. I’m sensitive to light, as though I have a migraine. I feel nauseated because I ate food for breakfast instead of a bowl of coffee. It’s crazy! I was just at the psychiatrist’s office a few days ago explaining how our society practically forces us to drink coffee and at a feverish pace. I pointed out the window “there is a Starbucks right there!” (And there actually is.) And it’s not just cups of joe coming out of there–the phenomenon of the “coffee drink” is insane in our North American, “if-you-can-cram-sugar-in-it-by-God-do-it” culture. So now it’s gone from a venti dark roast into a “venti white chocolate mocha with an apple fritter please” at the drive thru. We can’t even get out of our cars! So you may be asking “Well why are you quitting, then?” The reason: blood pressure. It’s not high at all, but the doctor does worry about my heart. It also wouldn’t hurt my pocket book if I quit. I mean, $7.50 every morning, sometimes twice, adds up pretty quick. Even if I do it at home in the Tassimo it’s still about $1.25 a cup. Back in the day I used to smoke, and that was significantly easier to quit than this. Probably because I only smoked in my car. So I stopped driving that car and the cravings went away. I didn’t suffer any physiological symptoms, strangely. I think it’s a lot like dieting. Food is around us. Caffeine is around us. Alcohol is around us. The lottery is around us. All are addictive but they’re not necessarily deadly unless taken to extremes. Normally right now I’d be in my office working on a quilt top. Instead I’m sitting on the couch under my massive sampler that I’m still quilting to keep from shivering and feeling too crummy. Now I just need to wait patiently for tomorrow when my blocks of the month come out from Craftsy and Amy Gibson’s Sugar Block Club. I love making quilts. That is something that I keep focusing on for a mantra. Not to sound like I’m having a cheesy Oprah moment where I’m “making the connection” or generally having a eureka moment, but I thought I’d post about gratitude being around me. I’m on a bit of a philosophical kick right now because it’s just the sewing machine and me all day while my family is out at school and work. 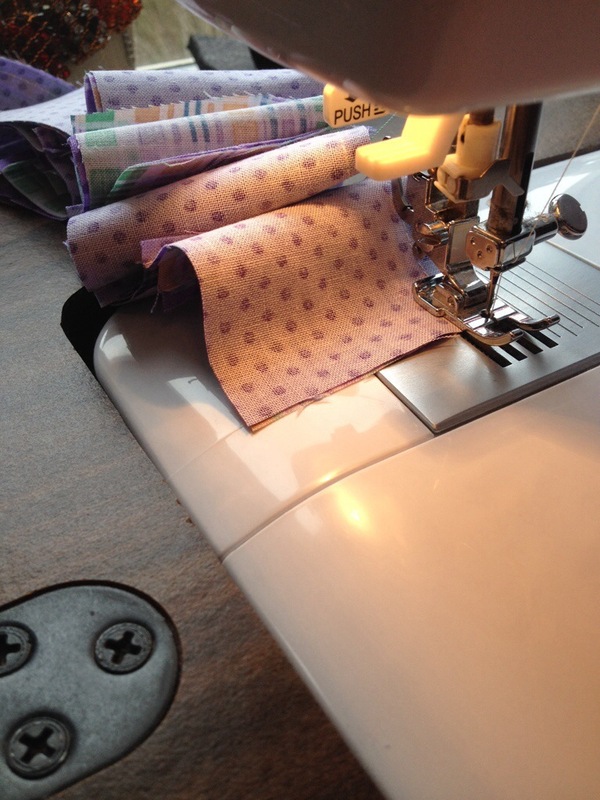 And lately I’m doing a TON of strip piecing, which is just like sewing down an Alberta highway–a zillion kilometers of 1/4″ straight seam allowance at a zillion kilometers an hour. Not that I’m complaining. It’s just that one gets to thinking about other stuff while doing that. I’ve gotten to the issue of gratitude. Initially when I started quilting (when I was pregnant with Bronwen, so about 5 years ago) I relied a lot on my basic sewing knowledge that I’d gotten through formal lessons as a kid. Yep–my parents put me in proper garment sewing lessons at the age of about 9. They let me use mom’s 1960s era made-of-Detroit-steel Singer at home to finish my projects. I made a shirt, some neon pink sweat pants (complete with elastic waist), a neon green draw string gym bag, you get the idea. It was the early 1990s and all things neon ruled my world! Fast forward to 2008: I had a new (plastic housing) Singer sewing machine (I still have that very basic machine and would like a new one, hint hint to my husband!) and a book of baby quilt patterns. I was feeling, well, maternal. I was just about to be pregnant and wanted to get into a domestic, yet creative and artistic hobby that could benefit my new family. So quilting made sense. And I thought I felt great! I made the cutest cloud quilt that was the best introduction to piecing because it called for only two fabrics and was made mostly with strip sets. Great! Of course, not too many points matched up because I didn’t have proper cutting technique (I didn’t realize there was this nifty tool called a rotary cutter) and I had no idea about how to get 1/4″ seam allowances. They were closer to 1/2″. And that’s when I was consistent. 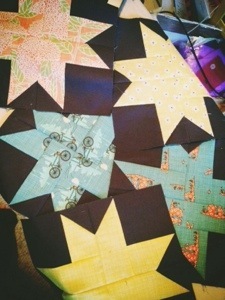 And then the part I looked forward to most–hand quilting! I have been a cross stitcher and embroider-er for enough time to know how to make pretty stitches. But I didn’t know one needed batting with NO scrim. Nor did I even think about basting. So my hands were pretty torn up and the quilt has virtually no quilting on it. But it still works. I am also proud of the fact that I mitred my binding! mitred on my first try! Anyway, why this foray into quilting history? Well, my local quilt shop, http://clothcastle.com handed out a form to say they were holding a quilt show for log cabin quilts. There was a small entry fee and whomever won the contest got to keep half the pot and donate the rest to a cause of their choice. I like a challenge and I did have a hankering to make a new quilt. I knew I wouldn’t win (and I didn’t) because I didn’t even know about rotary cutters, come on! But one thing they did was to say that we were to make these log cabins our own. Well, I made a ridiculously bold quilt, that’s for sure. It had needle turned applique, embroidery and hand quilting. I wish I could tell you that I was in the hospital for something easy like my gallbladder, which happened about a year later, but one morning when Bronwen was four months old, after I finished the bottle ritual that had worn me thin, I opened the cabinet to take my now large cocktail of anti psychotics, SSRIs, and anti anxiety drugs. The bottles were very delightful looking plastic vessels that shone in the sunlight. I had amassed many pills. I had amassed many horrific thoughts. I knew I was about to do something very wrong but felt my body acting in spite of any rational thoughts that were trying to break through. I swallowed every pill I had, excepting the Prozac. It was meant to make me happy and I didn’t feel like that drug would help my cause of death. I went upstairs and wrote a lengthy letter to my husband and daughter outlining my reasons for leaving them. I tried, most of all, to address my daughter to tell her that in no way was this her fault and she should never feel like that. I closed the letter, getting very groggy and clumsy with the pen now, with the final lines from Robert Frost’s poem “Stopping by Woods on a Snowy Evening”: “And miles to go before I sleep/And miles to go before I sleep.” The doubled line really drove home the length of my sadness, I felt. It didn’t matter that I needed to quote someone else to express it. I woke up several days later in an emergency ward and was shipped off to a mental hospital after being deemed “stable” in the medical sense. While convalescing on ward 4A I had managed to bring in some fabric and had gotten my portable sewing kit out of lockup. But what to do? Embroider! But what? All the names of the patients on the fourth floor with me that I knew. So I set to work. The result was a crib sized quilt with tons of names on it. When the quilt show finally came, I’d finished the quilt. I went and saw just how amazing some people with more experience were. It was great! At the end of the show, after the winner was announced, we were to collect our entries. I’d written a blurb to go with my quilt, explaining this story that you just read. And when everyone saw that I was the maker of this bizarre and busy quilt, I got so many hugs. Total strangers were lining up to hug me and wish me the best through my journey of a mixture of post partum depression, existing depression, and a rough personality disorder. They all saw my baby in the stroller and adored her. This post is for them. They shared a wealth of knowledge in that quilt show–not just of technique and possibilities, but that it’s not always necessary, even in our crazy stiff-upper-lip culture, to keep even our most deepest sorrows to ourselves. Just go to the quilt shop. Hugs abound! As a bead weaver, sometimes poet, sort of singer and drummer and often quilter, people always say I must be so patient. It has taken a lot of waiting to get here, to this parking lot. I would have called you crazy if you told me 10 years ago I’d have an articling student for a husband and I would be alive. I didn’t take good care of myself back then. I lived in a condo with my future husband and our cat, who we still have. I’d been in and out of hospital twice. But the worst was yet to come. It takes a lot of effort and waiting to figure out what we think should be obvious: ourselves. When I was 23 I knew I was living on borrowed time–taking over the counter codeine in prescription quantity to feel high. I thought it was because I’d gotten physiologically hooked as a teenager. But then the question was asked of me: why did I start taking them in the first place? Answer: suppression. I had no patience to wait out the bad. I had no idea that patience could come from within. It can be cultivated. The last time I was hospitalized was in May, 2012. I spent a week intubated in the ICU in a level 1 (no response to stimuli) coma from an overdose. Then I spent another 3 weeks upstairs stabilizing. I endured pneumonia and had pulmonary embolisms. I was alive and hated it. My body was like one raw nerve ending. I couldn’t even sleep. Neither, I found out, could a woman next door named Sharon. (The only reason I know her name is because the nurses and on call psychiatrists used it often and sternly, as though she were a 2-year-old sitting in time out.) They had her restrained on all 4 limbs. I could hear the harnesses squeaking as she thrashed and screamed “I am being harassed! I want a lawyer!” Repeatedly through the wee hours I would wake to this. Just as I was falling asleep, it seemed, there would be Sharon’s irrational screams. The night nurse came and stuck a container of hand sanitizer in my room. “What are you doing?” I asked, both exhausted and restless from withdrawal. I soon made the connection in my head: this is like labour and delivery. When the anaesthesia was working, (that’s a whole other story!) I could still feel the contractions and would pull on the bed rail. There was no pain, though. In between there was suspended animation as we waited for that disagreeable organ, the cervix, to do its thing. Sharon’s screams were the contractions. The quiet was the waiting for the contractions. Like delivering a child, the waiting would end. And in the meantime a new skill would be earned. I think of this often as I am chain piecing multiple blocks that are the same. Or hand quilting the same blocks–there is peace in repetition and in waiting. Let’s make an art of it and out of it. I made 40 star blocks! What’s in a name? I thought calling this site Busy Bee was totally me. But it’s not. I mean, I am busy. I have a just-turned-5 daughter, an articling student husband, a jewelry etsy shop, 2 Facebook pages, I’m all over Instagram, Flickr, Pinterest, YouTube, and I suddenly realized I am not blogging. So here I am. Blogging. I am not a complete n00b at this; I used to have a Live Journal site (do people even use this site anymore?!) and have tried in earnest to get into it with various false starts. So after closing the shop when the lease ran out I went on to full time jewelry making, which is totally fun. But I’ve run into many folks out there who fancy themselves jewelry designers/makers because they buy everything at outlet stores for cheap. They just weren’t interested in paying for it. So I turned to my love of quilting and embroidery. 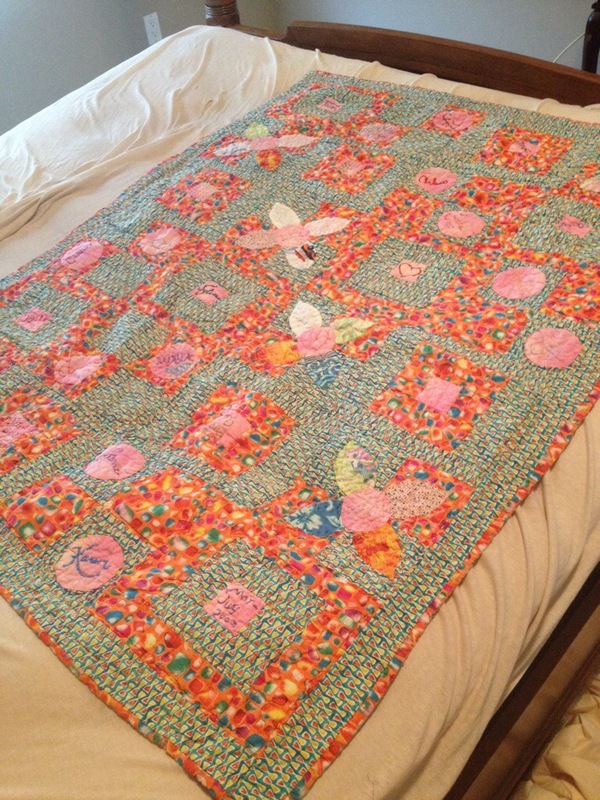 I made my first quilts when I was pregnant and have always liked it. 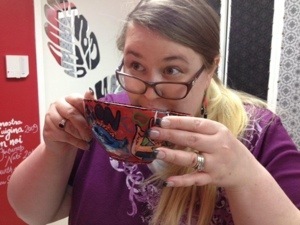 Then I took a free Craftsy class–Amy Gibson’s BOM (block of the month) class from 2012. It was such fun that I haven’t put my machine away since! 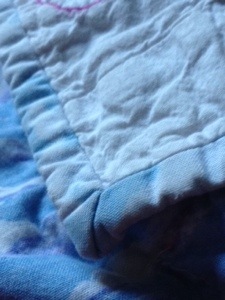 I’ve sold quilted pillow cases and given many spectacular quilts as gifts that people truly cherish. I love that feeling. It’s just as rewarding as when I hand quilt something. It’s just me, my thread, needle and trusty open top thimble. Suddenly the world fades away and I don’t feel like the image a busy bee connotes: buzzing around trying to collect as much pollen as necessary. No, I’m meditative and at peace. I think that’s important. More important than anything.